I'm thinking about acoustically treating my room so I can listen to my mixes in higher clarity. I'm trying to think of how I can do it cheaply (even though you get what you pay for, I suppose), and my uncle, who is a composer, covered his studio in eggboxes. But the idea of doing it with eggboxes seems ridiculous. Is this really a legitimate thing? Is this really a good thing to do? What kind of differences will it make? And, supposing I do purchase some egg boxes, how should I then use them to create acoustic panels, etc, and treat my room? Empty egg cartons have lots of problems when it comes to being used as acoustic treatment. They are a fire hazard! - This should be enough right here. They only do anything to fairly high frequencies - they don't have the mass, size, or stiffness to affect mids or lows very much, if at all. They don't do anything very good to high frequencies. There's nothing acoustic about the shape of egg cartons, so they just add a little bit of uneven diffusion at a certain frequency range. In some ways, they aren't even that cheap. First you have to buy a lot of eggs, then you have to put in a lot of labor to mount them in any reasonable way. They are ugly. Vibe is important for musical creativity, in my humble opinion. If you want quality acoustic diffusion on a budget, do a web search on "diy acoustic diffuser" and you'll get a ton of decent hits. Before you do anything to your room, you might want to assess what, if anything, should be done. Start by clapping your hands once every 3-4 seconds while walking around the room and listen for a "ping" or "zing" sound after the hand clap. If you hear that, you have flutter echo and you will want diffusors on opposite walls to get rid of it. Then same test but instead of clapping, make a "shhhh" sound in short bursts by using your lips to start and stop it. Like "pshht!" as loud as you can. Listen for the zing or ping. Final test, put on some low bass sounds or low frequency sine wave sweeps and walk around the room, listening to whether the sound is louder or quieter in some places than others. If you hear that, you've got standing waves. Most rooms have both problems with flutter echo and standing waves, based on the size and construction of the room. Large enough rooms will have standing waves below the audible frequencies, so they aren't a problem, but it takes a very big room for that. Flutter echos can sometimes be eliminated or reduced a lot with strategic placement of bookcases. Standing waves are very hard to get rid of. You can invest in bass traps for standing waves, but it's only ever going to help a bit, not completely solve the problem. The only real permanent 100% solution for standing waves is to know you've got them and adjust your mixes accordingly. One more problem that everyone who mixes indoors has is early reflections. This is what you definitely want to attack, and doing so will help with flutter echo. ERs come from the walls, floor and ceiling where the surface acts like a mirror and bounces the audio right back at you just milliseconds after the direct sound hits your ears. The best way to handle these is by sitting at your mix position and having a friend run a mirror over the wall behind the speakers, behind you, the side walls, and the ceiling and put a piece of tape wherever you can see the speakers in the mirror. You want to put a diffusor at all of those locations. For the floor, get a rug, unless you already have a carpeted floor. Your uncle may be a composer, but he clearly is not very knowledgeable about music technology, recording and acoustics. The misunderstanding comes from so-called "eggbox foam" panels like these. They are designed to eliminate higher-frequency reflections in a room, as part of making the space more acoustically "dead". The foam absorbs the air pressure waves, of course, and the idea of the rippled surface is to stop the foam itself acting as a reflective surface. In fact we now know that there are better patterns, but historically the eggbox pattern was (and still is) very common. The problem is that some people saw the pattern, didn't notice that it was made out of foam, and decided to nail up actual egg cartons. It's a slightly sad cargo cult approach to acoustics: the actual cargo cults built something superficially like an airstrip in the hope of attracting planes; whereas eggbox users nailed up something that looked superficially like a real acoustic panel in the hope of attracting good acoustics. They achieved nothing for their rooms apart from turning them into a major fire hazard. I wanted to add my two-cents regarding the fire-hazard. Acoustic foam (and the unauthorized use of pyrotechnics) were the cause of The Station Nightclub Fire in 2003, killing 100 people and injuring 230. "The foam was installed in two layers, with highly flammable urethane foam above polyethylene foam, the latter being difficult to ignite but releasing much more heat once ignited by the less dense urethane. Burning polyurethane foam instantly develops opaque, aggressive, dark smoke along with deadly carbon monoxide and hydrogen cyanide gas when burning." If you invest in egg flats, expect to be disappointed in your investment. These were initially used in homemade studios back in the 1950s and people pretended that they made things sound better. It took a decade or two for people to actually start studying acoustics and sound before they discovered their inadequacies as acoustic treatment in small studios. Folks who advocate for egg flats as acoustic treatment will surely profit from updating their knowledge and methods of recording techniques. Actually is isn't "ridiculous" but probably not great. If your goal is reverb reduction then pretty much any absorbing material will help. For example thick drapes on the walls, tapestry, etc. This is a much needed feature in every modern restaurant in the states as they are all echo chambers (imho). But there are other issues related to recording and sound. 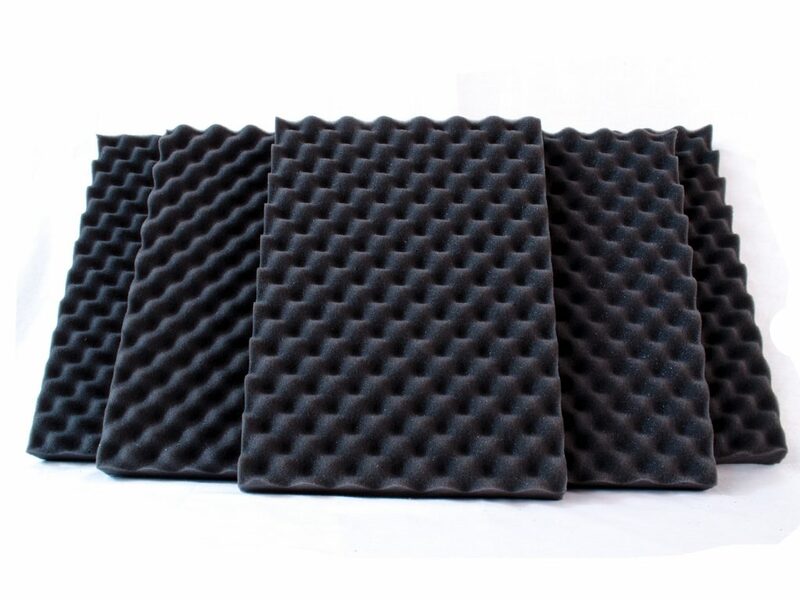 Placing egg crate foam and other absorbing material will reduce reverb over a large frequency band but may leave some residual reverb (echo). A little background hiss may be desirable but modern recording technology allows you to control the details post recording. Actual egg crate material is probably not as good an absorbing material as foam but the other phenomenon is diffuse scattering, this breaks up sound wave so they can not produce a high volume reverb. Independently of this is sound proofing. If your studio is in your home then you can control outside noise and won't bother neighbors. But to really control the quality of sound recording and avoid calls to the police you would need true sound proofing. Foam on the walls will not do this. The increased thickness may offer a little help but not at all frequencies. Baffling is used to truly sound proof a room, preventing outside noise from entering and your sound from exiting. This is usually something like layered sheet rock or other material with some soft absorbing or diffusive material in between the layers. Foam is cheap baffling is expensive. Also, baffling can be so heavy as to place requirements on the spacing between beams in the underlying structure of the walls, ceiling, etc. Thus in most places it would require a permit to upgrade a room like this, complete with an engineering analysis and architecture plans if required. Back in the 80s we used to hang heavy blankets, and prop up mattresses to accomplish a similar effect. To know if the egg crates really worked you'd need to compare an FFT of a recording with and without the egg crates for similar settings and instruments to see what the noise level is. That would be an experiment well worth doing imo. Not the answer you're looking for? Browse other questions tagged acoustics or ask your own question. Do bass traps actually reduce noise for neighbors? How can I get a less directional sound from a loudspeaker? How do I make drums sound satisfying in a room without soundproofing? Any bed sheets thick enough to be used as sound proofing? Can music time signatures really be irrational? How to lower the tone of a natural horn? How can I graph sound waves of chords? Are the Piattino Sound Proofing Castor Cup really efficient and are there other equivalent solutions?